Traveling on wheels, on water, or in the air can be pretty cool. Find out what it takes to drive a race car, ride through the back country, restore an old car, get behind the wheel of a semi truck, or fly over the water. 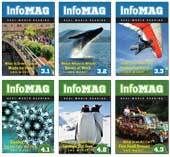 InfoMAG uses Sound Out levels to make informational text highly accessible for struggling readers. 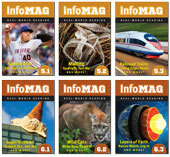 Designed for independent or one-on-one teacher-directed reading, InfoMAG features decodable, real-world informational text that provides opportunities for students to apply and practice the phonics and decoding skills they have been previously taught, while supporting development of decoding skills and informational/nonfiction reading goals at the same time! 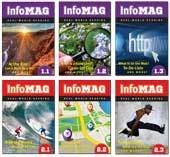 Each InfoMAG contains real-world informational texts such as articles, ads, blogs, and menus that students can easily access because most of the words in the texts are wholly decodable. 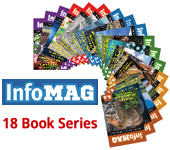 Each City Secrets title is now enlarged to a 7x9 format with full-color images throughout.Our informational text uses short, but complete sentences to convey the history and facts of each City Secrets title. Each X Sports title is now enlarged to a 7x9 format with full-color images throughout. Our informational text uses short, but complete sentences to convey the history and facts of each X Sport title.